SRO and Kunos Simulazioni to launch SRO E-Sport GT Series! The virtual GT racing championship is set to launch at the historic Italian circuit Monza next month! Sim racers across the globe will have the opportunity to compete for a once-in-a-lifetime prize this year by testing their skills in the SRO E-Sport GT Series, a new virtual championship created in partnership between SRO Motorsports Group and Kunos Simulazioni. Set to launch at historic Italian circuit Monza next month, the contest will be played out using Assetto Corsa Competizione, the official game of the Blancpain GT Series, which is developed by Kunos Simulazioni and published by 505 Games. The new virtual championship will consist of four qualifying events and a deciding finale, all of which will be staged alongside rounds of the 2019 Blancpain GT Series. With both on-site and online participation options available, every Assetto Corsa Competizione player will have a chance to be involved. The grand prize will transport three standout sim racers from the virtual world into a full-blooded GT car as they join the accomplished Lamborghini Squadra Corse for a racing experience. As part of this, they will be evaluated on their driving, physical and mental skills and sample the atmosphere within the team. All info will soon be available at www.sro-esport.com. Qualifying rounds will feature three classes – Pro, Silver and Amateur – with each consisting of 12 competitors. The Pro class will be selected on an invitational basis, while the Silver category will cater to online players, with the 12 contenders emerging from an Assetto Corsa Competizione hot-lap challenge. Finally, the 12 Amateur class drivers will earn their spot on-site during the race weekend. There will be three class finals per qualifying event, with the top four drivers from each progressing to the round final. The top-three finishers in this will be celebrated on the track’s official podium and, most importantly, earn a place at the season’s grand finale. The first qualifying event will take place alongside the season-opening Blancpain GT Series race at Monza on 13/14 April, followed by French venue Circuit Paul Ricard (May 31/June 1). 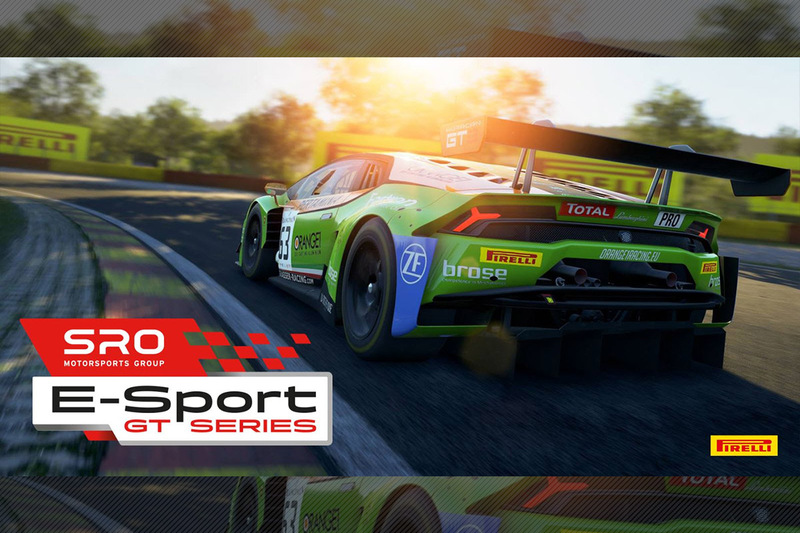 The third SRO E-Sport GT Series contest will coincide with the season’s biggest race, the iconic Total 24 Hours of Spa (25-28 July), before the final qualifier is staged at the Nürburgring (30 August/1 September). Focus will then shift to the grand finale, which is set to take place alongside the season-ending Blancpain GT Series event at Circuit de Barcelona-Catalunya. Here, the winners of a potentially life-changing opportunity with Lamborghini Squadra Corse will be decided. The initiative will receive the valuable support of Pirelli, the official tyre supplier of the Blancpain GT Series and a global standard-setter in road and track tyres. It will also enjoy the backing of AK Informatica, the Italian gaming hardware and events company that has earned a worldwide reputation for excellence in its field. What’s more, RaceDepartment will be present as the initiative’s official media partner and will provide live streaming, video showcases, interviews, articles and forum support. All Assetto Corsa Competizione players will be eligible to join the competition by visiting the official website, www.sro-esport.com, where the championship regulations will be posted and updated. The site will also be home to media materials, highlights and exclusive insight. With the new SRO E-Sport GT Series preparing to launch and a superb prize awaiting its winners, an exciting new dimension will be added to the 2019 racing season.